Willing Workers 4-H Club members ride on their first-place float. Celebrating a Festival of Trees, Osage City was lighted with holiday cheer Saturday for the 13th annual Christmas on Market Street. 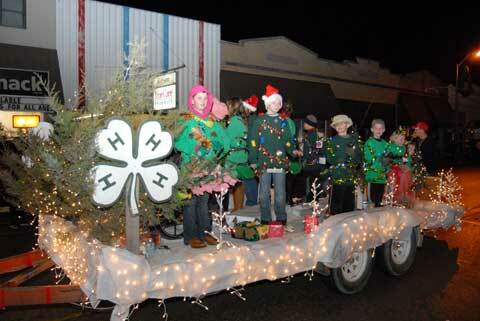 Adorned with evergreens and 4-H Clover, the Willing Workers 4-H Club had the first-place float in the parade. Willing Workers 4-H Club is open to all youth 7-19 and offers projects in many interest areas. 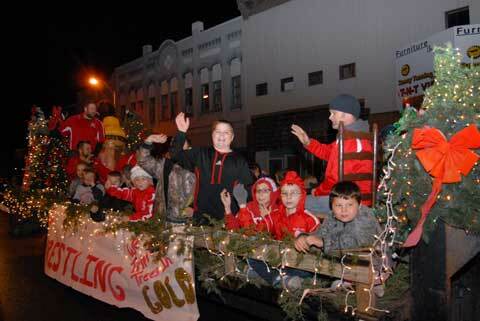 Osage City Wrestling Club decorated the second place float with the slogan “We trim our trees in Gold.” The club is made up of wrestlers 4 to 14 and is in its eighth year. Tournament is Dec. 6 at Osage City Schools. Wishing “Seasons Greetings” Osage Nursing Center’s float took third place and encouraged parade spectators to cozy up to a fire with family and friends to get out of the cold. Master of ceremonies for the parade was Willie Atchison, with songs of the season provided by Osage City Middle School and High School bands, directed by Melissa Askren. Boy Scout Troop 106 presented the colors. 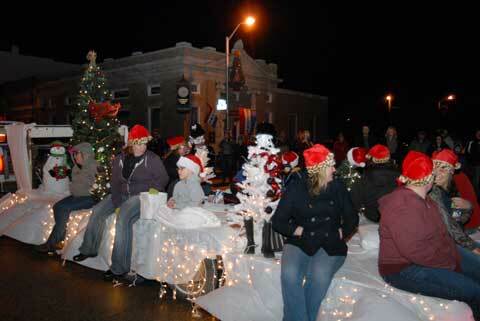 The 2014 Christmas on Market was hosted by the Osage City Chamber of Commerce. Proceeds of the daylong celebration benefited local organizations such as ECAT, ECKAN and the Osage City Warmth Fund. Other parade participants were Osage City Police Department, Osage County EMS, state Rep. Peggy Mast, 92.9 The Bull and 105.9 KISS FM, Osage City United Methodist Church, Chamber of Commerce, with truck and trailer provided by David Williams and Reed Co. of Lebo, Osage City Taxi, Reading Fire Department with Chief Wilkerson, Osage City Fire Department – OCFD No. 2, Bethanie Gilliland and Jag Trucking with a 1949 John Deere tractor, TNT/Furniture Loft, Body Shop and Buenger Automotive 1955 GMC pickup, MAJIC 107.7 and NASH FM 1029, and Santa Claus, who helped light the downtown lights. Osage City Christmas on Market co-chairs Shannon Stevens and Hannah Buenger are to be thanked for the Merry Christmas on Market for organizing the parade and the day’s events. The celebration was also assisted by staff of the city of Osage City and the Osage County Senior Center. More photos of the day’s events are here. See related story here. Osage Nursing Center family and friends celebrate while gathered around the Christmas tree on the third-place float. 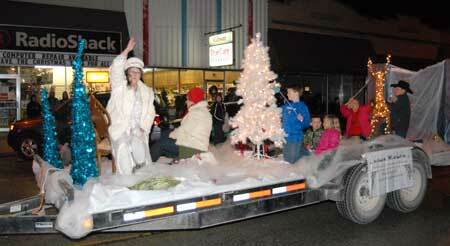 Osage City Chamber of Commerce’s float of festive trees. 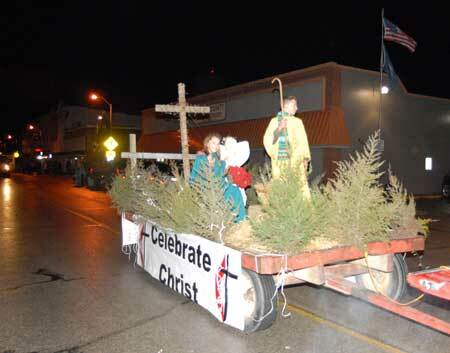 Native evergreens adorn Osage City United Methodist Church’s float. 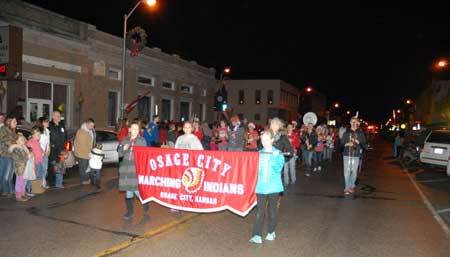 The Osage City Marching Indians provided the evening’s holiday music. 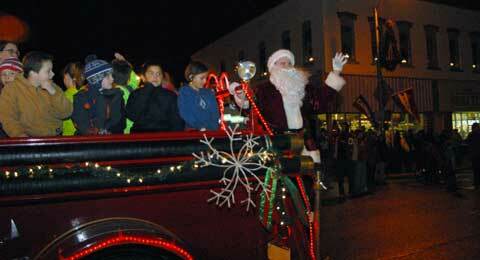 Santa Claus arrives on an antique fire truck to help with lighting downtown Osage City’s holiday decorations. 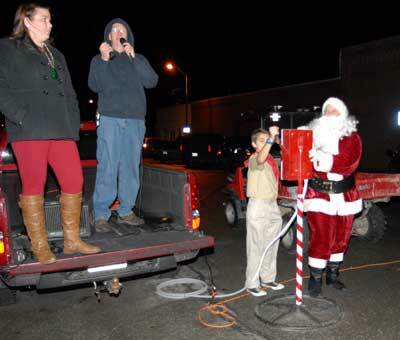 Hannah Buenger, parade co-chair, and Willie Atchison countdown while Santa and a Troop 106 member switch on the downtown decorations.